Ocean Station Vessels (OSV) or Weather Ships captured atmospheric conditions while being stationed continuously in a single location. While While most of the collection Navy vessels would go to a specified coordinate, stay for variable lengths of time, and record weather and meteorological observations. The collection begins in 1940, at the onset of WWII, when meteorological observations in the Atlantic Ocean were critical for military strategy in the Eastern theatre. While the vast majority of the collection derives from United States Navy and Coast Guard vessels, Ocean Station Vessels were considered an international cooperation, and there are a few non-United States ships included as well. Beginning in the 1960s, satellites and buoys capturing climatological data began to replace Ocean Station Vessels, almost completely phasing out the use of these ships by the mid-1970s. The collection includes a significant quantity of upper air observations on microfilm as well as paper transmittances describing instrument statistics, abnormalities, and basic reporting. Search WebARTIS--collection OSV--for more detail about available data in the physical archives. NCEI provides customers with information and data from the NCEI archive. To order NCEI products and services contact the customer support team. More information about Ocean Station Vessels from the US Coast Guard. 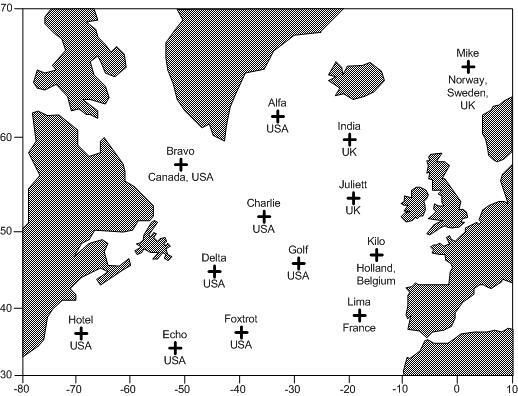 Keyed data from Ocean Surface Vessels can be found here. Many of these observations were keyed by the archive into Card Decks (184, 116, and others) in the 1960s. These collections have since been incorporated into other Marine datasets available from the Archive, but is primarily found in DSI 1160. Purpose Provides a stationary, in situ reference point for meteorological observations in the ocean. The information was used by commercial, military, and civilian organizations to track weather and storm systems over the ocean before satellite observations were commonplace. Lineage Statement Observations were collected by the U.S. Navy (through WWII) and the U.S. Coast Guard in conjunctions with the International Civil Aviation Organization (ICAO). Data were then transferred to the Archive for long-term storage.